Watch our Taiwan Episodes here. And don't forget to subscribe to our YouTube Channel so you will get automatically notified when our new episodes are out! For our last stop before heading back to Taipei (and then back to Singapore), we meet up with some friends to check out Seascream in Keelung, famed for their seafood flavoured ice cream. How does "Squid ink", "Pineapple and Shrimp", "Passion fruit and Tuna", "Cuttlefish and Mint" and "Tuna and Strawberry" sound as ice cream flavours? Watch our host Joanne-Marie try some in this finale episode. This small town in New Taipei City was a relatively isolated village until the discovery of gold during the Japanese occupation in 1893, which helped the town prosper and develop during the gold rush. The buildings have largely remain unchanged, and the Japanese influence on both architecture and culture is obvious. Today, the town is filled with both nostalgic Chinese and Japanese-styled cafés, tea houses, and souvenir shops, as well as fantastic views of the Pacific Ocean. The Gold Museum boasts plenty of historical, humanities and natural heritage, and it is an interesting place for history lovers to visit and one gets a good introduction to the prosperous past of this now quiet town. It's been said that if anyone can lift the 220kg gold bar, it is theirs to bring home! Taiwan has many old railroad stations that have turned into tourist attractions because of their charm and colorful cultural history. Jingtong was originally a coal mining town and it's the train station is one of Taiwan's four remaining wooden stations. We check it out, together with Jingtong Old Street, and a short ride up to Pingxi Station. The Sunger Lingzhi Farm is the first minsu that offers an interesting Lingzhi-themed experience. It includes visiting the farm where Lingzhi are grown, having Lingzhi cuisine for lunch/dinner, and so on. Watch as Joanne-Marie indulges in a sumptuous meal full of lingzhi-themed delicacies. Su Ao is a small, quaint town in Yilan County. Famous for seafood and cold springs, this rather small place doesn't seem to be frequented by western tourists. Su Ao Cold Spring has a spring water temperature of 22 °C.It is both bathable and drinkable, and has a pH of 5.5. Watch our host Joanne-Marie Sim take a dive, and a sip! Located on the serene, flat land of Buluowan (布洛灣), The Leader Village is a wonderful place to retreat to after soaking in the breathtaking gorge scenery. Buluowan, meaning “echo of canyon”, used to be a tribal village of the Taroko aborigines. The village itself provides entertainment and you'd be pleased to find that the village is run by 99% aboriginals. The Truku tribe members are a quiet yet friendly bunch, and would be pleased to include you in a night of song and dance. Watch some highlights in this episode! We head back to the mainland and start exploring Taitung. From coastal areas to mountain highs, Taitung greets visitors to a land of ecological richness and scenic beauty. Some of these natural charms have earned Taitung the nickname as the "garden of Taiwan.” In this episode we show you what Luye Gaotai, Tropic of Cancer Monument and Taroko National Park have to offer. We make a long drive up Taitung to catch a boat to Lyudao, also known as Green Island, a small volcanic island about 33 km off the eastern coast of Taiwan in the Pacific Ocean. In this first of 2 episodes on the island, we explore the Human Rights Memorial Park, which used to be known as the Green Island Prison. Ep 19: GangZai (JiuPeng) Desert in Pingtung. We head off to the Gangzai (also known as Jiupeng) Desert for some 4-wheeling ATV fun with 行情大腳車隊. If you are unfamiliar with handling "heavy machinery", you can also choose to ride pillion with one of the guides. However, it's a lot more fun if you take to the wheel yourself. In this episode, our host Joanne-Marie Sim shows you how! Ep 18: National Museum of Marine Biology and Aquarium in Pingtung. Next stop on our itinerary was The National Museum of Marine Biology and Aquarium, located on the north west coastal area at the foot of Gueishan (Tortoise Mountain) of Kenting National Park. Join Joanne-Marie in learning more about the diverse water and aquatic habitats in Taiwan. We then spend the night at YOHO Resort and in the same suite where Ang Lee stayed in when he was filming Life of Pi! Ep 17: Black Dwarf Cave and Fishing Village Villa on Little Liu Qiu Island in Pingtung. In this episode, we explore the mysterious "Black Dwarf Cave" and learn about the origin of its name, which came about as a result of a clash between the Dutch and indigenous people in the past. Our accommodation on the Xiao Liu Qiu island was at the charming Fishing Village Villa, which was previously part of a fishing village and has the closest proximity to the sea and sandy beaches amongst all the beachfront properties. From Donggang, we take a boat over to Little Liu Qiu Island, where the pretty coral island offers more than enough sea vistas, convoluted caves, sandy beaches, odd rock formations (including the Flower Vase Rock) and temples (over 100) to keep you happy for a long, long day, or two, so the next time you are in Pingtung, do consider making a pitstop over at this island! Donggang, a medium-sized town about an hour south of Kaoshiung, was the next stop of our journey. Upon arrival, we found that the usual malls, night markets, and hustle-bustle of Taiwanese towns was NOWHERE TO BE FOUND! However, we later found that not only was it THE PLACE to get your freshest seafood catch. Down one mountain and up another, we chanced upon Dachu Coffee Farm, a cozy joint nestled in a quiet corner, far above and away from the hustle and bustle of the city. We then head down the mountain and scootered over to Qigu, a popular tourist destination and many have come to view and photograph the salt plains and Salt Mountains, also known as Qigu Yan Shan. Continuing on our exploration of Fenchihu from the last episode, we take a stroll through Fenchihu Old Street, which stretches for 500 meters and is the old street with the highest elevation in Taiwan. It is filled with little shops and stalls selling local products, souvenirs and snacks - including the famous 'Train Cakes'. Fenchihu marks the halfway point of the world-famous Alishan Forest Railways on the way to the top of Alishan. Besides checking out the few old train engines and locomotives, visitors should also try the "Railway Lunchbox". Watch this episode as host Joanne-Marie tries one of these, and also show you what's in store at the railway station. Ever wondered how paper was made? In this episode, Joanne-Marie experiences first hand the process of making paper and eventually a paper fan, as part of the tour and DIY at Kwong Hing Paper Mill in Puli, Nantou. She wraps up the visit with some snacks made out of edible paper, and a deeper appreciation of paper-making. In this episode, Joanne-Marie visits the Fengjia Night Market, known to be one of Taiwan's biggest night markets. She makes some new friends along the way, to bring her around to see (and taste) the some of the best highlights. In this episode, Joanne-Marie rides to the 921 Earthquake Museum of Taiwan and is given a guided tour of the remnants of the second-deadliest earthquake in Taiwan, which is now a museum to show visitors how earthquakes happen, and specifically, what happened on the fateful day that it struck Taiwan. Joanne-Marie then makes the long ride down to Taichung, where she meets yet another kindred soul at the Rainbow Village. 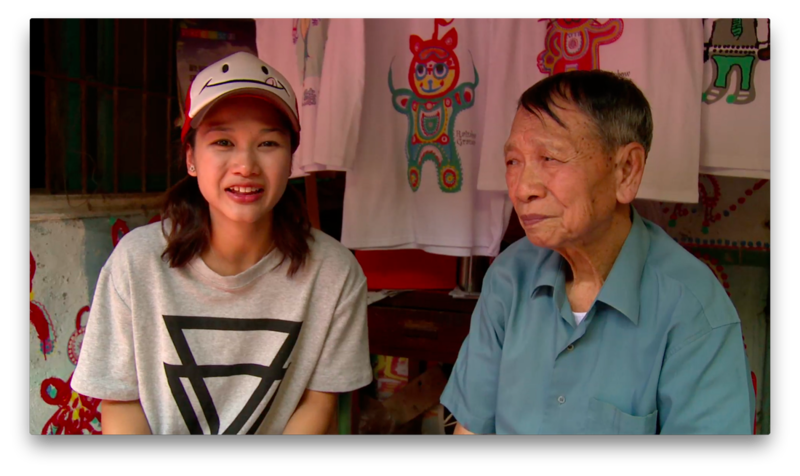 Affectionately known as 彩虹爷爷, which translates into Rainbow Grandpa, he tells her his story which led to him painting an entire village. In these episodes, Joanne-Marie sets off from Beipu and heads to Miaoli in search of the famed flying cows! Is she able to find any? Watch these 2 episodes to find out! 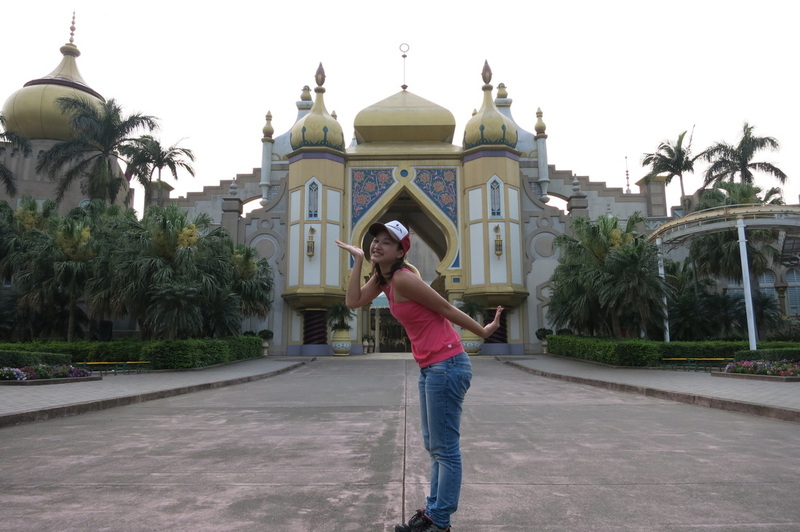 In the rustic, charming town of Beipu, Joanne-Marie goes in search of some nutrition for her tired self. Well known in Taiwan as a center of Hakka culture, Beipu is especially recognized for production of dongfang meiren tea （东方美人茶）and its special Hakkanese blends of tea and nuts called lēichá (擂茶), also known as Thunder Tea. Hidden in the mountainous area of HsinChu lies a resort with 4 thematic villas based on the popular Uni-group mascots (Open, Lock, 小桃). The villas have themes based on Japanese, European, Western/Cowboy, and Mediterranean. Each villa comes with 3 bedrooms, a living room, and lots of decorations/furnishings based on the characters. Join Joanne-Marie as she takes you on a tour around the European-themed villa! After travelling about 3 hours down south from Ximending in the rain, our host Joanne-Marie finally arrives at Leofoo Village Theme Park in HsinChu County. Fortunately the rain had lightened and the activities were ready and revving to commence! Before embarking on the long rides across the country, Joanne-Marie takes a break to explore Taipei's famous Ximending district, known for food and shopping that both tourists and locals rave about. We arrive in Taipei and check-in to the Airline Inn, as well as pick up the Vespa scooter before heading off to the quintessential landmark of Taiwan: Taipei 101. In this pilot episode, host Joanne-Marie shares her inspiration behind wanting to explore Taiwan off-the-beaten-track and on a scooter.